Instead of spending enormous amounts of money on overpriced products, pick out a cheap electric toothbrush that'll do the job just as well for a fraction of the price. Plenty of marketing goes into electric toothbrushes, with all sorts of promised health benefits, long-term dental hygiene cost savings, and all sorts of settings for superior performance. But are expensive sonic toothbrushes really worth it? On the other hand, you can get a cheap electric toothbrush for about $10, and the replaceable parts ensure it'll last for years. So is this the way to go? 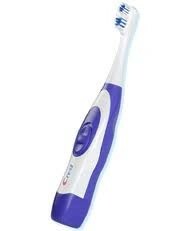 Electric toothbrushes can cost hundreds of dollars, and for that kind of money, they had better do something. Some of the pricier options offer multiple settings, timers, replaceable components, and all sorts of lofty promises, from cleaner teeth to healthier gums, and dental bill reductions. But are they really worth the cost? The answer, of course, is that it depends. Plenty of scientific studies have been conducted comparing manual vs electric toothbrushes, with multiple studies showing that, with proper brush technique, manual brushes can work just as well as electric brushes, and that the quality of brushing is generally more important than what type of brush is used, even in the cases of sonic toothbrushes whose vibrations clean teeth they're not even touching. They did, however, find two potential benefits; firstly, that electric rotary brushes are better than manual brushes at removing plaque and preventing gingivitis, keeping teeth healthier in the process. 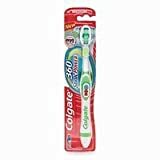 Secondly, people using electric toothbrushes brush their teeth for longer periods of time compared to manual brushing, most likely due to ease of use, which is especially helpful to seniors and children. Do you hate brushing your teeth? Yes? Then you'll benefit from an electric toothbrush. 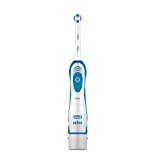 Oral-B electric toothbrushes are readily available, popular, highly praised, affordable, and you'll have a pretty easy time finding replacement heads for the brushes. There are plenty of models (a few too many, in fact) but the majority use the oscillating/rotating brush head design that has been proven to be more effective than manual brushing. Some Oral-B models include rechargeable internal batteries, while others use AAs. If you have don't have rechargeable AA batteries at home, definitely pick some up, as they are extremely cost-effective. 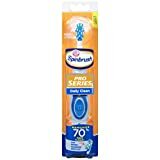 The Spinbrush from Arm & Hammer is one of the few cheap electric toothbrush options that is readily available, not only in starter packages, but its replacement brush heads are easy to find as well, stocked in drugstores nationwide. 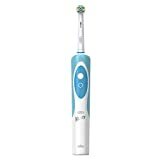 Cheaper than most of the Oral-B models, it's quite a low-cost option for those who want an electric toothbrush but get anxious about the price tag on some of the models from larger brands, though it doesn't receive quite the same high praise as the Oral-B models. For whatever reason, the Spinbrush is sometimes branded with the Crest logo. Oddly enough, Oral-B and Phillips seem to have a combined near-monopoly on the market, with the exception of the Spinbrush and a few others. While the market has not matured to the point that a wide variety of readily available options can be found in every drug store on every corner, replacement parts aren't difficult to find online, so you don't have to limit yourself to what's available down the street. 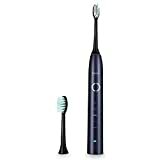 Check out the options down below for rotating electric toothbrushes from smaller brands. Disposable electric toothbrushes offer some dirt cheap, if not necessarily environmentally friendly, options for people who still want an electric toothbrush, but don't quite want to commit to the investment of the right one just yet. While it's much harder to find rotating brushes here (a vibration mechanism is a lot cheaper than a rotating mechanism), these will still make brushing significantly easier, while not necessarily adding the benefit that some of the rotary brushes offer. 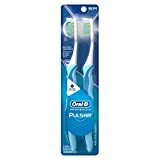 Still, for the price, they can be a fairly cheap and easy entry into the world of electric toothbrushes, and are also good for travel, if you don't want to bring the larger, heavier units on a trip. Many of these models do feature replaceable AAA batteries, so they might last longer than you might think, depending on how vigorously you wear down the bristles. Anti-microbial Soap? Just Say No! Sales of anti-bacterial soaps and cleaners are increasing. 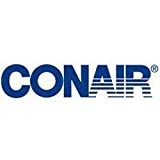 75% of American households use these products. So what do they have in common with an elite training camp for terrorists? Ever wonder if you have the same dragon breath your friend seems to unknowingly have? Everyone gets bad breath learn how to know when you have bad breath.